On this day a century ago French writer Henri Alban Fournier, better known as Alain Fournier, was killed in the fighting near Tranchee de Calonne, south-east of Verdun. 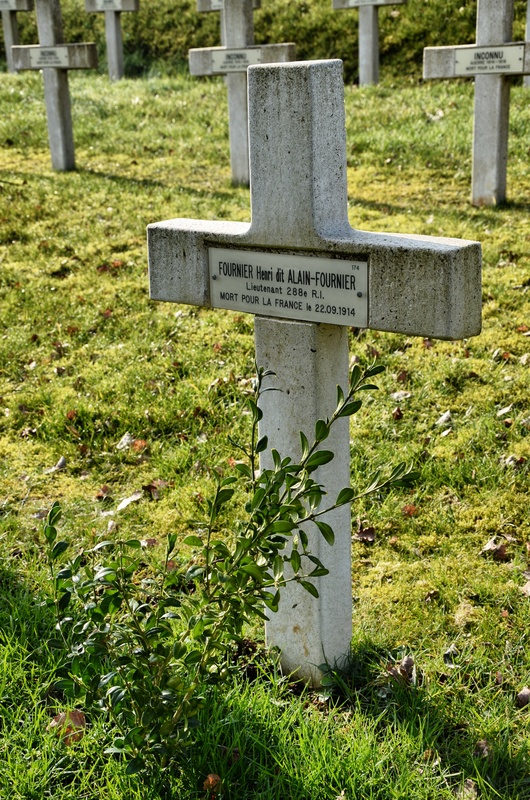 Author of Le Grand Meaulnes Fournier had done his military service before the Great War and was on the reserve when it broke out in August 1914. He was mobilised with the rank of Lieutenant and killed in the fighting on 22nd September 1914 but posted missing. His body was not found until 1991 when it transpired he had been buried on the battlefield with his men by the Germans. His remains were identified in this mass grave along with many others and they were moved to a French National Cemetery at Saint Remy la Calonne. The memorial shown at the top of this post is in the woods where the mass grave was found in 1991 and the glass pyramid preserves the battlefield graves were the remains of Fournier and his comrades were discovered.